This combo was designed for the smoker that wants to quickly roll up a quality smoke like a pro. Included in this kit is 64 RAW Organic King Size Slim Papers (2 packs), 63 pre-rolled tips, a RAW 110mm rolling machine (includes instructions), and a Roll With Us Doobtube. Toss your smoke and tip in the rolling machine, slip a paper around it and your ready slide it into the Doobtube for odor free transport to take anywhere with you. RAW Organic papers are made from organically grown chlorine free pure hemp and is processed in an eco-friendly manner. The result is a very thin light tan paper that burns extra slow and extra clean. It uses the same proprietary crisscross run-preventing watermark as RAW Classic but the color is much lighter and varies depending on the shade of the hemp used in production. The taste of RAW Organic is unlike anything you have experienced. It is a clean tasting smoke that is best described as natural, light and pure. 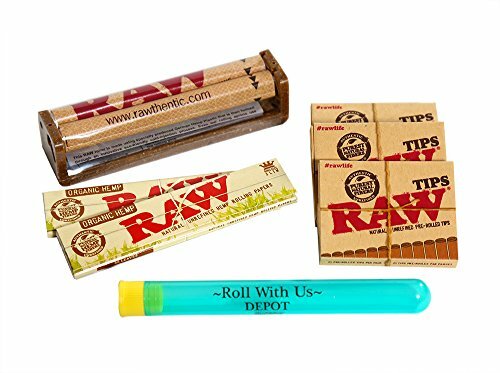 RAW Pre-Rolled Tips are natural and unrefined, giving you the most convenient way to quickly roll up on the go. They are constructed for perfect airflow and great filtration. No chemical bleaching or chlorine is used in these tips, so you can rest assured your smoke is safe. View More In Papers & Tubes. If you have any questions about this product by Roll With Us Depot, contact us by completing and submitting the form below. If you are looking for a specif part number, please include it with your message.